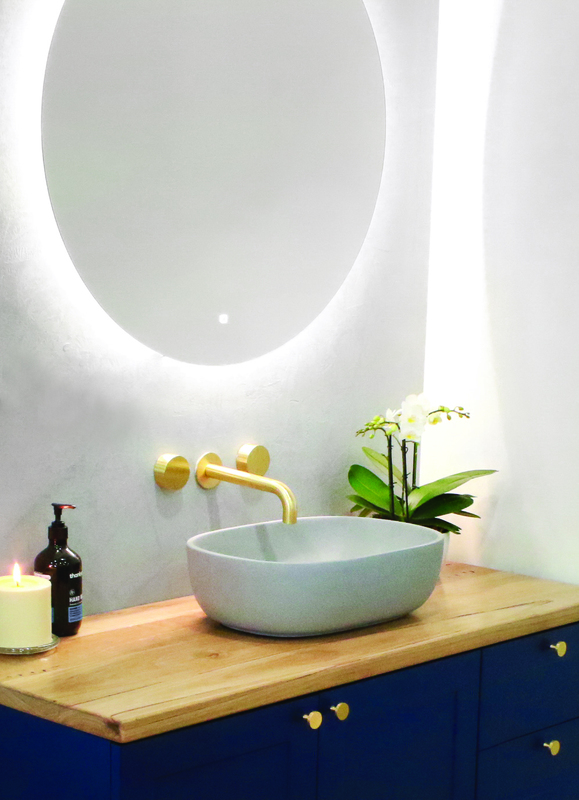 Summer 2019 is bringing new trends in bathroom design, including bold colours and remarkable mirrors, along with timeless favourites like brushed brass finishes and bespoke concrete textures. It’s safe to say this season is channelling bold and unique choices with the overall feeling of home luxury. With these emerging trends dominating the home scene in late 2018, now is the perfect time to give your bathroom the facelift you’ve been yearning for. Whether you’re looking to undertake a minor bathroom refresh or enact a full transformation, keep in mind your homes’ overall colour palette and how to best utilise the framework of your space in terms of layout and design impact. The embodiment of modern elegance, brushed brass finishes are undoubtedly making a comeback this year and will continue well into 2019. Suited to most colour schemes, but especially darker palettes, the warm, burnished tones and earthy industrial sheen of brushed brass give a luxe appeal to your bathroom, instantly adding value and a no expense spared look and feel to your home. 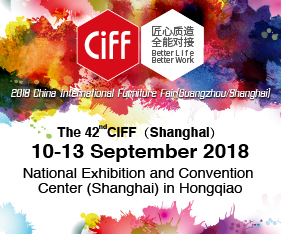 It is a classic, timeless finish that will stand the test of time and the addition of matching brushed brass elements like the showerhead, tapware, robe hooks or vanity handles in your to your bathroom introduce subtle touches of luxury. Pastels and neutrals may have been all the rage in 2017, but for those looking to move with the times and make a bold statement, darker colours are an emerging trend not to be missed. 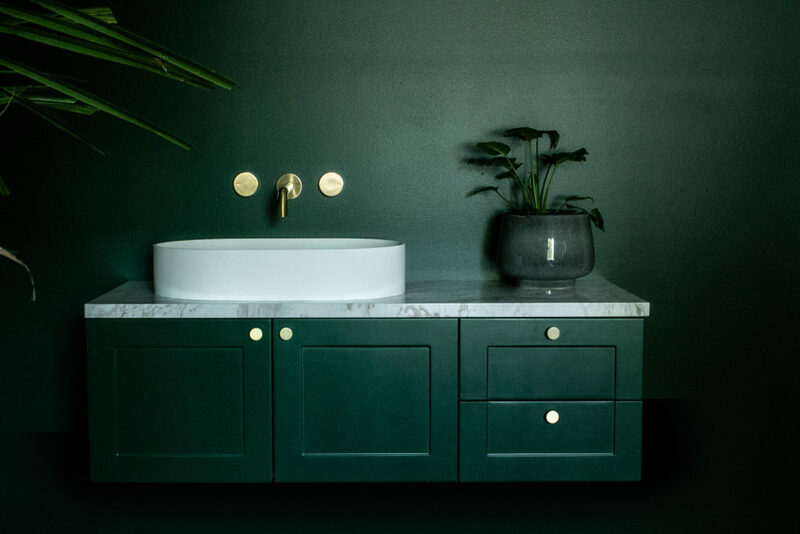 In particular, bathroomware and accessories in a deep forest green and striking navy are on the rise and will soon dominate new bathroom interiors. Whether you’re looking to splash some vivid colour over a vanity, plush towels, cabinetry or statement wall, bold colours will deliver the atmosphere you’ve been craving for your bathroom. Introducing a new and unique texture to your bathroom will transform the look and feel of the space dramatically. A concrete finish has a bespoke look and is fast becoming an interior design favourite. This Summer, the raw and industrial look of concrete is making its way into the bathroom. Consider bringing concrete textures into your bathroom by pairing a concrete basin with a timber vanity top or matte black tapware for a contemporary look. Bringing that 5-star feel to your home bathroom is a must, and what better way to do that than with LED mirrors. The streamlined look of an integrated LED mirror oozes a sense of luxury while significantly brightening up your bathroom with dedicated task lighting and creating the illusion of more space . Available in so many different shapes and sizes, there will be a variant to complement your style and decor. If the bright lights aren’t quite calling your name, opt for round or oblong mirrors instead. Unlike traditional square or rectangular mirrors with harsh and sharp edges, the curved profile of a round mirror can soften the overall look of your bathroom. With an elongated oblong mirror above the vanity, you’ll also be able to create the illusion of a higher ceiling, ultimately making your bathroom feel more spacious.